1640: A terrible curse falls on a beautiful island in the Indian Ocean... just because it was possible. It was quickly established that this dark magic not only affected anyone who tried to seize what was on the island, but also haunted anyone who dared even to approach its shores. Ingenious and opportunistic pirates soon realized that the island was a perfect place to hide their loot, since once buried here, it was almost impossible for it to be (re)stolen. 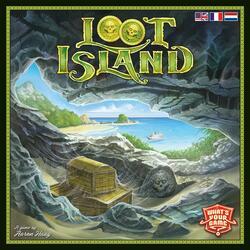 Proud of the exceptional creativity of their plan, they named it "Loot Island". As smart as they were clever, they had developed a perfect trick to fool the island: they buried amulets against this curse with their treasure and drew maps leading to their precious hiding places in case something went wrong... which, of course, happened. Humorless but not mean, the island did not like to be rolled at all and made sure that the pirates of the globe lost all their maps. Thus, all the treasures were lost forever... well... almost. Go in search of the pirate treasures lost on the island of Maudite in this game that is easy to handle but terribly sneaky: the player who finds the best balance between cooperation and competition, combined with a good synchronization of his actions and a bit of luck will win the game!